An option where the payoff is either some fixed amount of some asset, or nothing at all (discontinuous payoffs). 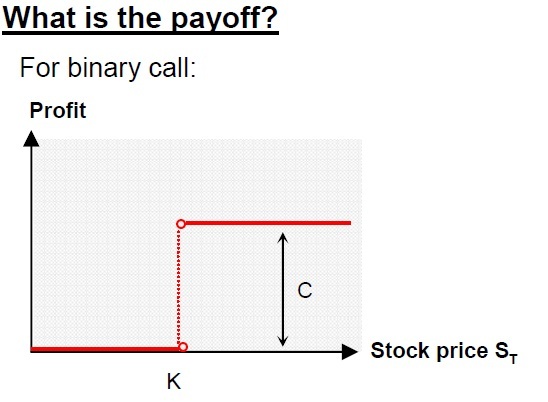 The most common examples of binary options are the cash-or nothing and the asset-or-nothing options. Also called digital options. Binary options can either be European or American and be structured as a put or a call. Underlying asset can be an event or a price point being attained. Asset-or-nothing: buyer receives an amount equal to the asset price itself. If instead it is out of the money, the option expires worthless. It is appropriate for an investor who believes that the market will be above/below a certain level at some specified time, but is not sure of the magnitude. Often is used to construct more complex option products. It can be seen as building blocks for a plain vanilla call which is constructed from an asset-or- nothing call with a short cash-or-nothing call where the cash payoff equals the strike. Less risky than traditional options as profits locked in as underlying performs, however, more expensive than a normal option. No need to constantly watch the underlying market level. Binary options genarly a help for every one who wnat to deal in some fixed amount of some asset, or nothing at all. so each and every one want to a fixed price. and for more information you can visit our blog.